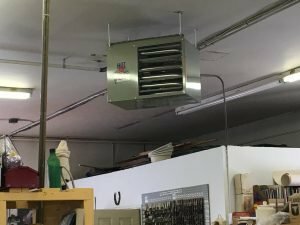 Garage Heating in Edmonton | J.W. Brian Mechanical. Plumbing and Heating. It’s no secret that Edmonton has some of the coldest, longest winters of any metropolitan city around the globe, which can take a toll on both you and your vehicles. Why not install heat, after all, is your garage not part of your home? Don't garages have feelings to? Why get into a freezing car in the morning when you can be toasty warm, laughing at old man winter as you pull out for work in the morning, and that's not even getting into the man cave benefits !! Help beat the winter blues buy installing one of these three main types of garage heating systems. Unit heaters - a square unit heating system that hangs from the ceiling, unit heaters can be either natural gas or hydronic (hot water). Tube heaters - simply another form of radiant heating, tube heaters are a long tube that radiates heat rather than blowing hot air, ideal for home hobbyist, for example, air brushing. In-floor heating - tubes that are laid within the concrete floor, in-floor heating is the ultimate space saver and makes use of a boiler, which can be part of the home heating system. Contact us for more info and a free in house consultation. Are you in Edmonton and dealing with a furnace repair emergency? Not to worry, because we are available 24 hours a day, 7 days a week, 365 days a year! Please contact us if you experience any issues with your furnace or boiler - in the near or immediate future.